Teaching during the month of December can be quite a challenge. Children have visions of sugar plums dancing in their heads while you may be trying to review fractions. Let's see exactly why children are so distracted and then what we can do to make learning easier this month. First, the curriculum will be different. More units will be centered around the holidays from Christmas around the world to the Christmas story. So substitute your science and social studies units with these units instead of trying to cram everything in, which will lead to frustration for you and your child. After all, the Christmas story is history! Second, your routine will be different so make sure your lesson plans reflect that. More baking, wrapping, shopping, making crafts, sending cards, looking at lights, serving others, practicing for Christmas pageants, and so on. Do your lesson plans have large buffers of time for these activities? For those rare December days where we will not be very busy, I made a few packets of worksheets to review concepts, such as: writing prompts, math facts, and grammar skills. Some worksheets I printed just for fun, such as: wordsearches, mazes, how-to-draw Santa, and crossword puzzles. Education.com has lots of FREE printables. I just LOVE that site! We will also be reading lots of holiday books during those days, too. I'm so relieved that I have taken the extra pressure off of myself and have allowed myself plenty of room to breathe and enjoy every second of December without feeling the mad rush. Third, your environment may be too distracting from the bright lights on your Christmas tree to the Santas and snowmen sitting on your shelves. No wonder children have a MUCH harder time focusing this time of year. Colors send signals to the brain without us even thinking about it. While the color green increases creativity and can work in your favor as a teacher, the color red can actually increase your child's heart rate and make it difficult to be still and focus. If you find your child having a hard time staying still and concentrating during learning activities, find a space where the distractions are less, such as your bedroom or outside on your patio or deck if the weather is nice (any place away from excess decorations and the color red). As an educator, it's important to know how color influences learning and what colors are best for specific learning environments. 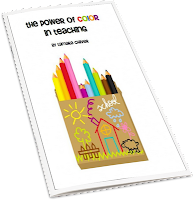 If you'd like to learn more about how colors affect learning, check out this FREE download- The Power of Color in Teaching. Here is a television segment I did a few years ago on how games actually help children learn faster and retain more. Since my kids are completely obsessed with Legos (read more about that HERE), I am incorporating Legos in my December lesson plans by having them complete the FREE on-line class offered by Curr Click- The 12 Days of Brickmas. They also are offering an Advent class, too. Talk about hands-on learning! They can't wait to get started! Be a little creative with your lesson plans and your kids will be excited to learn. Enjoy teaching during the holidays!